This title is an essential primer for all students who need some background in microbiology and want to become familiar with the universal importance of bacteria for all forms of life. 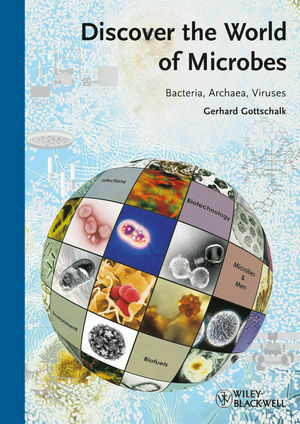 Written by Gerhard Gottschalk, Fellow of the American Academy of Microbiology and one of the most prominent microbiologists in our time, this text covers the topic in its whole breadth and does not only focus on bacteria as pathogens. The book is written in an easy-to-read, entertaining style but each chapter also contains a `facts' section with compact text and diagrams for easy learning. In addition, more than 40 famous scientists, including several Nobel Prize winners, contributed sections, written specifically for this title. The book comes with color figures and a companion website with questions and answers. Israeli Society of Microbiology, and a fellow of the American Academy of Microbiology. He was president of All European Academies (ALLEA) from 1998 to 2000 and president of the Union of German Academies of Sciences and Humanities from 2003 to 2007. 30 Viruses, chemicals causing epidemics? Discover the World of Microbes Companion Site Discover the World of Microbes companion site with Contents, Sample Chapter and Index.